Manage your store and sales from a smartphone or tablet — increase your small business profit by making your sales easy and fast with Loyverse POS, manage inventory, visualize sales analytics, acquire, retain, engage your customers and multiply their average spend. Install Loyverse software on your smartphone or tablet, start your sales, sign up customers. Manage one or multiple stores from the same account. Your analytics are in the cloud, always with you. Increase customer retention, run your own loyalty program, boost your sales. Seriously, this is the best POS system I have found within the Google Play store. It literally does everything that I need and want. Love how easy it is to use and customize. Thank you for making such an amazing product accessible!!! Everyone in the café loves using the product! I love the amazing support... its great to have a team supporting that knows what the end user is gonna need. When we started, we used to write all of our sales on a piece of paper, but soon we realised that we needed an efficient POS to automate our work. Loyverse Free software helps us a lot because it is very simple to use and to configure and it has a nice interface — offers stats on sales and best item sold. Make quick and easy sales, manage your loyalty program and inventory — all from your smartphone or tablet. Build your customer base and stay in touch. Send messages and e-receipts to your customers and collect valuable feedback. Make informed business decisions based on visual analytical reports. Analyze your sales, determine top-selling items, browse the history of your transactions. Improve your employee management and increase their performance. Manage multiple stores from a single account. View revenue, average sale and profit. Track sales growth comparing with previous days, weeks, months or years. Determine which items perform well, averagely, or underperform. View stock levels and receive instant notifications when items are running low or out of stock. 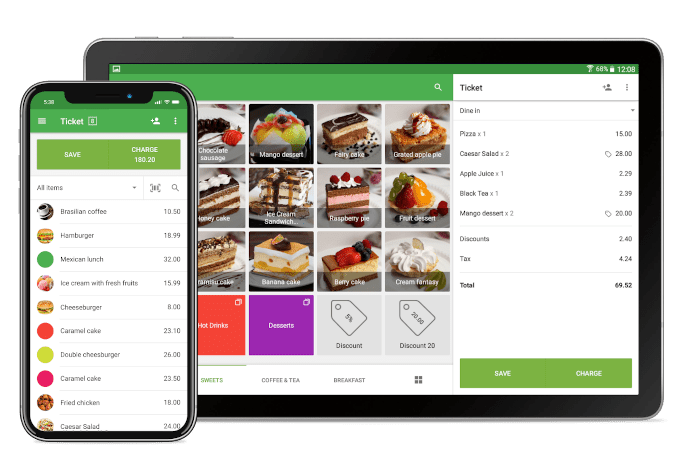 Get orders to kitchen automatically, faster and with less errors. See all tickets at a glance with colors indicating wait time. Never miss a new order using sound notifications. View list of completed orders and re-open them if necessary. Less paper, less mess. Save and go green. All order details are visible including modifiers, discounts, taxes, etc. Sell from your smartphone or tablet and send electronic receipts to your customers. Easily add items with descriptions and images. Organize into categories for faster access. Define roles and permissions for your employees. Determine who are the best performers. Forget bulky spreadsheets. Detailed daily, weekly and monthly reports help visualize your business growth and make informed decisions. Run your own system to reward your customers for their loyalty. Turn once-in-a-while shoppers into regulars.